What is Tazorac (tazarotene topical)? The Tazorac brand of tazarotene topical gel and cream are used to treat plaque psoriasis (psoriasis with scaly patches) and to treat facial acne. The Avage brand of tazarotene cream is used to reduce the appearance of fine wrinkles on the face, mottled light and dark skin patches on the face, and benign facial lentigines (noncancerous freckles). Tazarotene topical may also be used for purposes other than those listed in this medication guide. What is the most important information I should know about Tazorac (tazarotene topical)? Do not use tazarotene topical if you are pregnant or if you could become pregnant. Tazarotene topical is in the FDA pregnancy category X. This means that tazarotene topical is known to cause birth defects in an unborn baby. You must take a pregnancy test and have negative results within two weeks before starting treatment with tazarotene topical and treatment should be started during a menstrual period. Brith control must be used during treatment. If you become pregnant, stop using birth control, or miss your menstrual period, immediately stop using tazarotene topical and notify your doctor. Avoid exposure to sunlight or artificial UV rays (e.g., sunlamps). Use a sunscreen (minimum SPF 15) and wear protective clothing during the day when being treated with tazarotene topical. Do not use tazarotene topical on skin that is sunburned, windburned, dry, chapped, or irritated. Also avoid using this medication in wounds or on areas of eczema. Wait until these conditions have fully healed before using tazarotene topical. What should I discuss with my healthcare provider before using Tazorac (tazarotene topical)? are taking any other prescription or over-the-counter medicines, including vitamins and herbal supplements. You may not be able to use tazarotene topical, or you may require a dosage adjustment or special monitoring during treatment if you have any of the conditions listed above. Do not use tazarotene topical if you are pregnant or if you could become pregnant. Tazarotene topical is in the FDA pregnancy category X. This means that tazarotene topical is known to cause birth defects in an unborn baby. You must take a pregnancy test and have negative results within two weeks before starting treatment with tazarotene topical and treatment should be started during a menstrual period. Brith control must be used during treatment. If you become pregnant, stop using birth control, or miss your menstrual period, immediately stop using tazarotene topical and notify your doctor. It is not known whether tazarotene topical passes into breast milk. Do not use tazarotene topical without first talking to your doctor if you are breast-feeding a baby. How should I use Tazorac (tazarotene topical)? Use tazarotene topical exactly as directed by your doctor. If you do not understand these instructions, ask your pharmacist, nurse, or doctor to explain them to you. Tazarotene topical is usually applied once daily at bedtime. Follow your doctor's instructions. Cleanse the skin with a gentle cleanser and allow it to dry completely (20 to 30 minutes). If a bath or shower is taken prior to application of tazarotene topical, the skin should be dry before applying the gel or cream. Apply a thin film of tazarotene topical to the affected skin. Avoid applying the medication to unaffected areas. If medication accidentally gets on areas that do not need treatment, wash it off. If a cream or lotion is used to soften or lubricate the skin, it can be applied either before or after application of tazarotene topical. Allow the first cream or lotion applied to be absorbed into the skin and dry completely before application of the second product. Do not apply tazarotene topical to the eyes, ears, nostrils, mouth, angles of the nose, mucous membranes, open sores, or irritated skin. If you get medication in any of these areas, rinse it off with water. Do not use tazarotene topical on skin that is sunburned, windburned, dry, chapped, or irritated. Also avoid using this medication in wounds or on areas of eczema. Wait until these conditions have fully healed before using tazarotene topical. Do not cover treated areas with dressings or bandages. Do not apply tazarotene topical more often than is directed. Using too much of this medication may cause marked skin redness, peeling, or discomfort and will not lead to more rapid or better results. Do not use tazarotene topical beyond the date printed on the bottom seal of the tube. 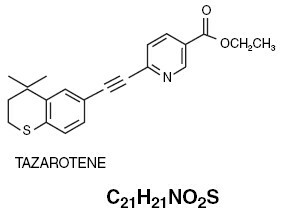 Store tazarotene topical at room temperature away from moisture and heat. If you forget or miss a dose, do not try to make it up. Return to your normal application schedule as soon as you can. Do not apply a double dose of tazarotene topical. An overdose of this medication is unlikely to occur. If you do suspect an overdose, or if tazarotene topical has been ingested, call an emergency room or poison control center for advice. Symptoms of excessive topical use of tazarotene topical include marked redness, peeling or discomfort. What should I avoid while using Tazorac (tazarotene topical)? Avoid exposure to sunlight or artificial UV rays (e.g., sunlamps). Use a sunscreen (minimum SPF 15) and wear protective clothing during the day when being treated with tazarotene topical. Do not use tazarotene topical on skin that is sunburned, windburned, dry, chapped, or irritated. Also avoid using this medication in wounds or on areas of eczema. Wait until these conditions have fully healed before using tazarotene topical. Serious side effects are not likely to occur. Stop using tazarotene topical and seek emergency medical attention if you experience an allergic reaction (shortness of breath; closing of the throat; swelling of the lips, face, or tongue; or hives). You may experience some skin burning, warmth, stinging, tingling, itching, redness, swelling, dryness, peeling, or irritation while using tazarotene topical. If these side effects are excessive, talk to your doctor. You may need a lower dose or less frequent applications of tazarotene topical. What other drugs will affect Tazorac (tazarotene topical)? a phenothiazine such as chlorpromazine (Thorazine), prochlorperazine (Compazine), fluphenazine (Permitil, Prolixin), promethazine (Phenergan, Promethegan), perphenazine (Trilafon), and others. The medications listed above may increase the sensitivity of the skin to UV rays from sunlight or artificial light (e.g., sunlamps). Generally, tazarotene topical should not be used during treatment with any of the medicines listed above. Drugs other than those listed here may also interact with tazarotene topical. Talk to your doctor and pharmacist before taking or using any prescription or over-the-counter medicines, including vitamins and herbal products. Your pharmacist has additional information about tazarotene topical written for health professionals that you may read.